Following on from the previous post we have just clocked that London based Photographer Viktor Vauthier has uploaded photos of D*Face's Zombie Oscars. 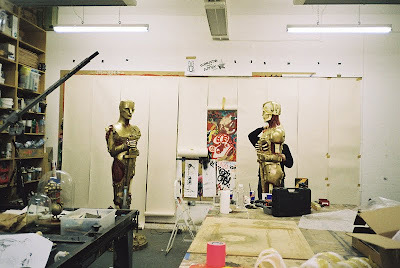 The photos appear to have been shot in D*face's London studio and show the artist applying the finishing touches to the sculptures before they were installed in LA. View the complete set of shots over on Viktor's website.